How do I pick seeds for my Minecraft worlds? Pretty simple actually. I want a seed that has all of the interesting biomes within a reasonable distance. But I don’t want to know where they are, because I like exploring and mapping out my world. So I want to choose a seed that has all biomes within some specified distance, while also not seeing the actual map of those biomes. Personally, I like to use 5,000 blocks from origin (so a 10,000 x 10,000 area). For that, I created Minecraft Blind Seed Search. Right now it’s simple: it just tells you which biomes are within the range you specify. I may want to add an option for finding seeds with a village near spawn, or spawn in a specific village, but for now, this works for me. Behind the scenes, this site is built with Gomix, and gets the biome information from the MineAtlas backend. I have contributed to the MineAtlas patreon, because it’s awesome, and if you want to support Minecraft Blind Seed Search, I hope you’ll contribute to MineAtlas as well. How do you pick seeds for your Minecraft worlds? Let me know in the comments. One reason I like the Death With Consequences challenge in Iberia is that you can use the forced restart that comes with a death to challenge yourself in a new way each time. I’m a big fan of self-imposed challenges to make the game more fun, exciting, difficult, or just plain weird. They can change the way you play so significantly that you accomplish completely different things, learn about whole areas of the game you’ve never explored, and leave you with a totally new experience each time you play. But that’s all just high falutin talk – let’s get down to brass tacks. I first discovered the concept of self-imposed challenges when I heard about the city construction challenge. It’s a challenge where you willingly submit to a set of rules that limits what tech you can use in the game, and to level up you have to build parts of a city, until you’ve eventually got a whole city built. As I played I realized that I had imposed challenges on myself before that, specifically not letting myself branch mine until I had diamonds. That forced me to explore caves or trade with villagers. Since then I’ve tried other challenges, like not using the F3 debug screen, turning off natural regeneration, etc. At this point, you’ve probably noticed that some of these ideas made it into Iberia. In fact, Iberia came from me trying to take self-imposed challenges and enforce them in a realistic way through a Minecraft mod. And now that I have it, I’ve realized it not only imposes obvious challenges. Through death with consequences, it gives you a structure for experimenting over and over again with self-imposed challenges. Each time you die, you begin a new life. And with each new life, you can play the game a completely new way. Obviously, I could have done this without Iberia, but the added structure makes it easier. And I’m tempted to find ways to encourage that more through the mod. But for now, I’m just exploring different ideas each time I die. Currently, I’m only allowing myself a single chest for personal storage, forcing me to build dedicated structures for storage of different items. 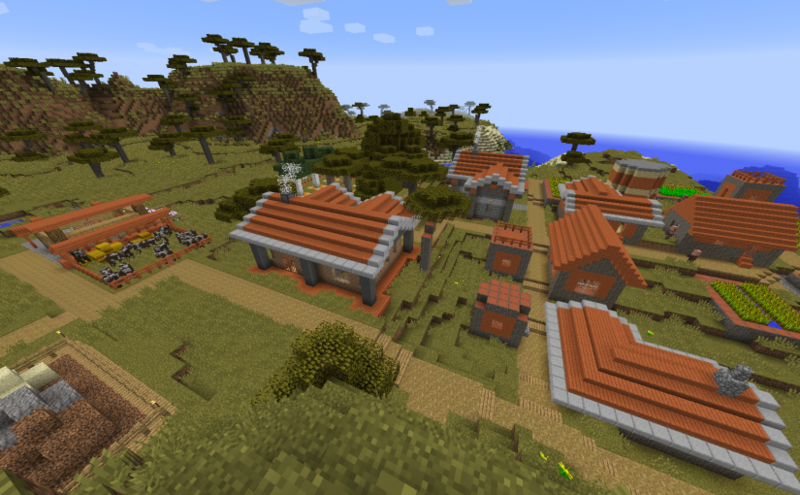 I spawned near a savanna village, so I’m building it up with a tree farm, tannery, stonecutter’s smithy, brickmaker, kitchen, etc. It’s a fun new challenge, not unlike the city construction challenge. As I’ve done it, I’ve thought about what I might do the next time I die. If I had died relatively quickly, I probably just would have picked up the same challenge in a new location. After 1 to 3 days above ground, you must play the rest of the game below ground. For many of these tweaks, the primary effect will be to lengthen the early and mid game experience. I enjoy that. For some, you may find other interesting twists to the game that you wouldn’t have considered otherwise. With debug info turned off, I realized the Nether was much harder to navigate. Specifically, it was really hard to link up nether portals effectively. One trick is to build two portals in the nether 17 blocks apart in one of the four cardinal directions. Then find the relationship between them in the overworld. At that point, you can determine directions in the Nether, making exploration and nether portal linking significantly easier (though still pretty hard). What self-imposed challenges do you like? Are there any that would make good additions to Minecraft itself?